We’d love your help. 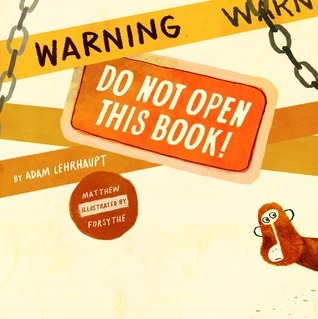 Let us know what’s wrong with this preview of Warning by Adam Lehrhaupt. CAUTION! This book contains monkeys, toucans, and a whole lot of silliness. You really shouldn't be opening this book. It looks like a book, it feels like a book, and it even smells like a book. But watch out...madness and mayhem lie within! Debut author Adam CAUTION! This book contains monkeys, toucans, and a whole lot of silliness. You really shouldn't be opening this book. It looks like a book, it feels like a book, and it even smells like a book. But watch out...madness and mayhem lie within! Debut author Adam Lehrhaupt urges you NOT to take a walk on the wild side in this humorous, interactive romp with inventive and engaging illustrations from Eisner Award-winning comic artist and rising star children's book illustrator Matthew Forsythe. 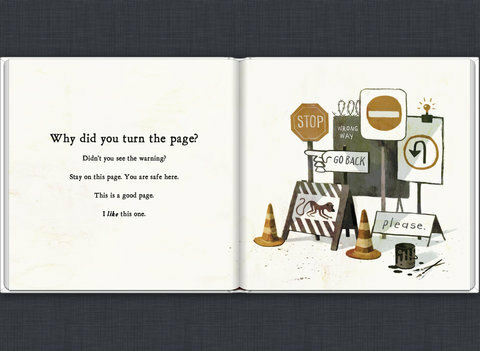 Picture Books That Break the "Fourth Wall"
Since this is my book, I don't feel right giving it a rating. Also, I don't think there are enough stars. Instead of a traditional review I'm going to use this space to try to tell you a bit more about my book. So, that's what the book is about. Of course, Matt's illustrations are awesome and these silly pics don't do them justice. But, you get the idea of what the book is about, right? Beware. You really shouldn't open this book!!! I were a hipster librarian or parent who hadn't read a zillion picture books I would give this a higher rating. But though the art is very striking, this concept has been done a zillion times before--and by people with far zanier imaginations. They warned me and I did not listen! 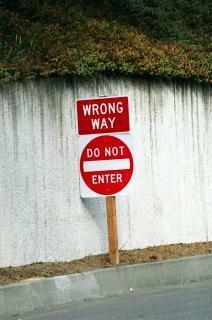 When will I learn!!??? This turned Gabe from a whiny sullen tired kid into a giggling cuddle machine. Going to try it at storytime this week and see how the kids like it. The best way for me to describe this book is that it is kind of like The Monster at the End of This Book on steriods. "CAUTION! This book contains monkeys, toucans, and a whole lot of silliness. You really shouldn't be opening this book. I'm serious. Just put it back on the shelf. Right...now. You're still reading this? Well, don't say I didn't warn you..."
We've read a couple other books by this author and I was and wasn't impressed. This one sounded really cute so i thought I'd get it for my nephew sometime... And with the lot that I picked out this was another winner! He LOVED this book and read it a couple more times after we finished, snapping the book closed, lol. He had ZERO trouble picking a page to draw. There is this magical combination in monkeys, toucans and an alligator that just causes giggles and delight. The art is quite delightful and dark. It adds this creepy shiver down your back as you break the "rules" or the signs telling you to turn back. I love the tonal changes going from bright white backgrounds to dusty yellow and to totally black! The words are spot on and draw you into the story, but if words aren't necessary they aren't shoe-horned in, the page is left word free and it let me and my nephew discuss what was going on instead. You may believe this is a message-less book, take that aunt obsessed with messages! Haha the jokes on you as this book has its message so woven into the story it isn't readily apparent even as its teaching its young readers... YOU must take action if you want something to happen. You've got to have a plan (trap) and execute it! It's quite ingenious and deserves a spot in EVERY home library... really the only thing its missing is a little brown boy!! BOTTOM LINE: Perfect for a rule breaker to fall in love with reading! Four stars only because THE MONSTER AT THE END OF THIS BOOK did it first, and that book has my whole heart. But this is a fantastic, playful romp. Would recommend to kids of any age. One reason I became a teacher was that I read The Monster at the End of This Book to a class of first graders when I was a second grader. It was a powerful moment with a book that I love. This book brings that feeling back. It's fun, silly, and brilliant. Can't wait to read it to my students. Cute but redundant. Seriously, go back to The Monster at the End of this Book. The author's review is better than the book, actually. Ha! Funny and meta with lots of potential for interactivity. Would be good for story time. This review has been hidden because it contains spoilers. To view it, click here. 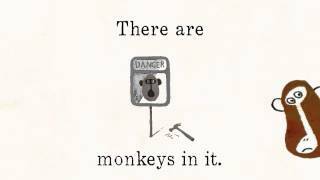 The book warns the reader not to read it because you don't want to let the monkeys out. The signs try to stop the reader but of course you want to keep turning the pages until the monkeys come out, go wild and make quite a mess. Next the toucans arrive. Later an alligator shows up. The author suggest you set a trap with a banana. It is very cute. It is a unique offering for young children. Highly recommended for Grades K-2. There are a whole slew of these "don't read this book" books and I'm not sure what they're trying to teach our children. This one was at least clever, though. How did I miss this book when it was published? It is just the right length for my 3-5 year old class, with a plot involving monkeys, toucans, and an alligator-what preschooler could resist? It encourages problem solving, a skill we talk about frequently in preschool science class. I will report back after I have tried it in storytime. This book has been very clearly written to entice the reader to turn the page and keep reading. Children love to challenge rules so this book is certain to excite them as they break these rules and turn the pages. Well, now you've done it. I wash my hands of it. It's all your fault. You were warned. Seriously, this is fun little read that is two barrels of monkeys full of fun. 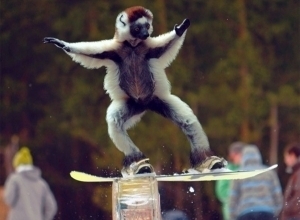 Yes, there are monkeys. And toucans. And an alligator. And a banana. But maybe I just spoiled something. Warning: Do Not Open This Book! is a clever addition written by Adam Lehrhaupt. This story is about a secretly plan composed by the reader to catch the monkeys, toucans and alligator after proceeding forward in the book and never yielding to the warnings. ~ it breaks the fourth wall. The invisible narrator of the story leads you along while demanding the author to interact with the story; the book is completely based around whether the not the audience Warning: Do Not Open This Book! is a clever addition written by Adam Lehrhaupt. This story is about a secretly plan composed by the reader to catch the monkeys, toucans and alligator after proceeding forward in the book and never yielding to the warnings. ~ it breaks the fourth wall. The invisible narrator of the story leads you along while demanding the author to interact with the story; the book is completely based around whether the not the audience is willing to interact. 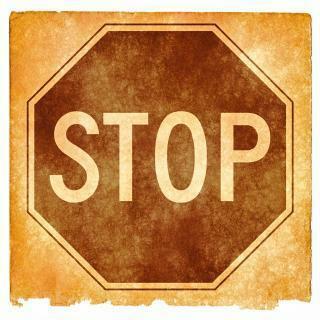 ~ the story provides cause-and-effect scenarios for the reader to interact with and figure out. This type of problem-solving that, especially in lower level or easier children's books, helps influence and promote higher level comprehension skills. This also allows children to make inferences that can help better comprehend a text in a general sense. ~ the silly tale always children to make connections across different areas of meaning and create prototype to stereotype connections. The fact that the book explains the toucans and monkeys love bananas and they can use that to also catch the alligator. The book provides cross section learning rather then a linear problem-solving "Dora the Explorer"-esk tales. Very cute. It begs to be done in storytime. And what a PERFECT lead in to "Five Little Monkeys Swingin' in a Tree." 10/23/13 This was the book that gave me an idea to do a Hello, Audience! storytime (since I love those kinds of books and figured I had enough to do as a theme). The kids loved this. It's a little shorter than I expected and I think that was my fault that it fell a little flat near the end. But the very end was great and they loved shutting their make-believe books. I think this cou Very cute. It begs to be done in storytime. And what a PERFECT lead in to "Five Little Monkeys Swingin' in a Tree." 10/23/13 This was the book that gave me an idea to do a Hello, Audience! storytime (since I love those kinds of books and figured I had enough to do as a theme). The kids loved this. It's a little shorter than I expected and I think that was my fault that it fell a little flat near the end. But the very end was great and they loved shutting their make-believe books. I think this could work in a toddler storytime. Loved that one of my girls tied in the alligator with "Tick Tock" as well as the song. 10/7/15 Opener for "Troublemakers" theme. Went very well, though halfway through the book I got a bunch of late-comers, all first-timers. They of course sat on the far edges. And then another newbie kept complaining that she couldn't see the book when I was panning to the sides. Obviously never been in a storytime before, as she caused a lot of other disruption as well. I don't know. It's one of those books that's purely entertainment. Lots of colour and movement, a simple story and certainly engaging. Readers are enticed to participate and embrace the humour and novelty. But, you know, I like Bland's The Wrong Book better. This is a book that basically tells the reader not to turn to the next page because of some peril that might befall them. There are monkeys, toucans, and an alligator. There is a cool little "trap" at the end of the book to rescue the reader. I thought this book was going to be so much better than it was. It seemed to have such a great idea, but it fell short of my expectations. I didn't care much for the illustrations either as they seemed to be all over the place and "modernistic" in nature. (I This is a book that basically tells the reader not to turn to the next page because of some peril that might befall them. There are monkeys, toucans, and an alligator. There is a cool little "trap" at the end of the book to rescue the reader. This book is a great example of the proper use of the medium. The story begins on the front page and extends over the end pages all the way to the blurb which holds different meaning depending on whether you read it prior to the story or afterwards. The artwork is big bold and fun which combines well with the text. It really plays with what a reader can expect from the text and how the author interacts with the reader. Reverse psychology at its finest is an excellent tool in children's literature. Who doesn't love breaking the rules? 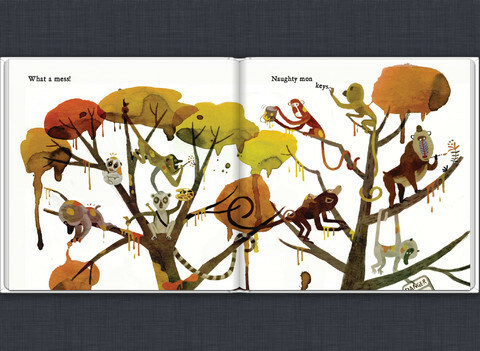 When paired with monkeys, toucans, and a bossy narrator, its a recipe for fun reading. The richly toned illustrations of monkeys monkeying about add to the hilarity. This would surely be a story time hit. My son Sam LOVES this book and I know my second graders will feel the same way....if I can sneak the book out of the house this week to share it with them. It reminds me of "We Are In a Book" and "The Monster at the End of this Book!" 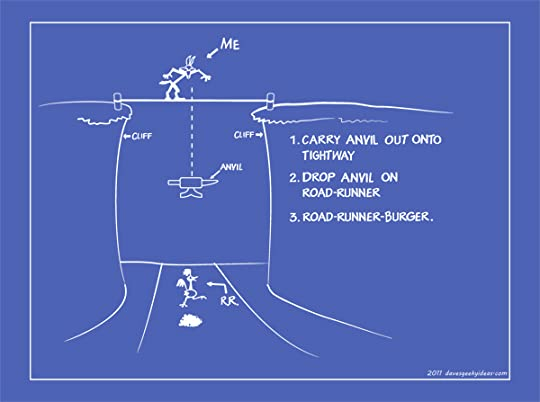 Just pure fun and great illustrations! Fans of Monkey Truck, this book is for you. Only it's significantly less weird. Buy this title from Powell's Books. A great start, but the end left me unsatisfied. It's as if it ended too quickly for me. It reminded me a lot of The Monster at the End of This Book by Jon Stone, which I love so maybe my expectations were set high. Nevertheless, it's still a fun book. Young readers will get a chuckle out of it. Monkeys, toucans, alligators and a trap - it's load of interactive silliness. Reminds me so much of Monster at the End of this Book. Book Title: Warning: Do Not Open This Book! Opening line/sentence: Maybe you should put this book back. 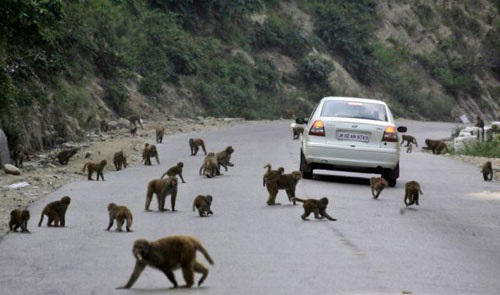 You don’t want to let the monkeys out. Brief Book Summary: This non-traditional picture book actively involves readers in the story, warning them to NOT open this book. Once they do, readers are warned again to close the book. As you continue to read, the narrator talks to Book Title: Warning: Do Not Open This Book! Brief Book Summary: This non-traditional picture book actively involves readers in the story, warning them to NOT open this book. Once they do, readers are warned again to close the book. As you continue to read, the narrator talks to the reader asking questions like, “Why did you turn the page?” Monkeys and toucans and alligators are unleashed, the reader makes a trap to catch them, and then the reader quickly closes the book at the end to trap all the animals inside the book and keep them from escaping. Response to Review: I agree that the tone of the color in the illustrations goes nicely together, creating a nice continuity among the animals. I also agree that this book is super fun, and that any kid would love to engage with this text. The book actively involves the reader, and put kids (the readers) in a position of power to say no (something they rarely get to do) and also to be in control of the story. All of these aspects, makes this type of book really appealing for young children and super fun to read aloud to a class. Evaluation of Literary Elements: As pointed out by Kirkus reviews, the color palate for the illustrations follows the same warm tone, creating continuity within the book. The author also varies the font and the text to convey messages of importance, tone, or volume- sending indications to the reader about how to read the text. 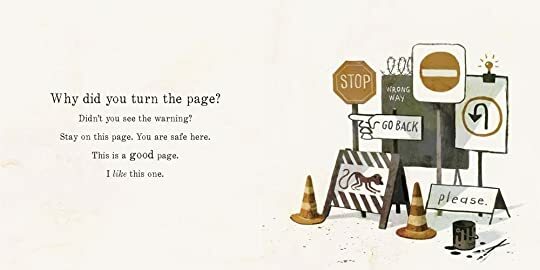 The book also uses different signs warning the reader not to keep reading, speaking directly to a reader (a rare occurrence in children’s literature). There is a page in the book that displays a blueprint of the master plan to trap the animals- here, children have access to a different genre or style of text. On the blueprint, kids are gaining exposure to different ways to use text, including labeling. 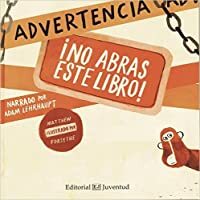 Consideration of Instructional Application: This book would serve a decent model text to talk about labels and signs (non-traditional ways to read and write). This book would be great as a read aloud since it actively involves listeners/readers. This could be great to use in the classroom since it elicits participation from the students, making sure that they are engaged with the text, their peers, and their environment. I would also consider using this book as a model text to talk about how we can manipulate the text itself to convey emotion or meaning. For example, if the text is large and in all capital letters, what does that signal to the reader? If the text is italicized, what does that signal to the reader? The ending was great but the rest wasn't quite as quirky as I thought it would be.